- Students learn to think through how they communicate rather than rely solely on their instincts. - Prompts students to question their assumptions, challenges them to think critically about why and how they communicate, and provides solid tools and takeaways that they can employ to communicate effectively even in difficult situations. 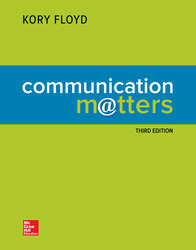 Create your own customized Communication Matters at www.mcgrawhillcreate.com.